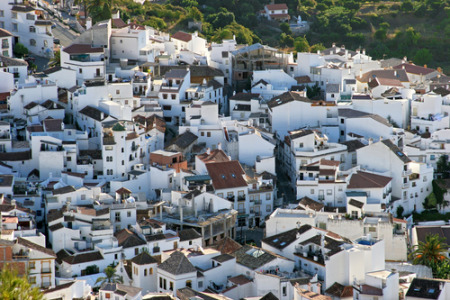 Ojen holidays take you to a charming inland village, close to Marbella on Spain's Costa del Sol. Sitting in an elevated postion the village enjoys superb panoramic views over a stunning landscape. Holidays to Ojen can be taken at any time of year as the summers are long and hot and the winters are mild. The busiest months are from April until October with temperatures reaching the low thirties at the height of the summer. Holidays in Ojen appeal mainly to couples and golfers. Although not far from soft sandy beaches, families tend to choose resorts that are closer to the coast. If you are looking for a relaxing break in a traditional village away from the bustle often found by the sea, you may be tempted by our cheap Ojen holidays. They are considered great value as our commitment to quality and service is never in doubt. With good accommodation and amenities, our low cost Ojen holidays are sure to please. The area is ideal for ramblers as there are many scenic trails into the foothills of the Sierra de la Nieves. Golfers have a choice of courses in the vicinity. To make the most of your visit, car hire would be advantageous. This pretty village with an old church at its heart, offers a retreat, and respite from a busy world, so if you need to recharge your batteries, check out our last minute Ojen holidays and you'll surely find one to suit. For further details and to view our best Ojen holiday deals, please use the search facility.